Come enjoy the fun and adventure of Medieval Times! Special activies for Cubs include camping in tents, archery, bb guns, fishing, craft project, campfire, games, jousting? !, and more! Limited to the first 350 that register! Sunday Check out at 9:30am. Early registration is $55 for the cub/parent team. After April 20th, the fee will be $65 for the cub/parent team. Additional Parents are $10 each. 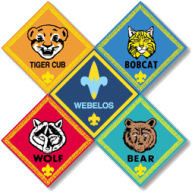 Additional Cub Scouts are $25 each. Fees include all activities and Saturday Dinner, Cracker Barrel (don't know what they mean by this, if anyone finds out, please email the webmaster) and Sunday Breakfast. All paid youth participants will receive the Special Camp 2012 Patch! Register individually by April 20, 2012.